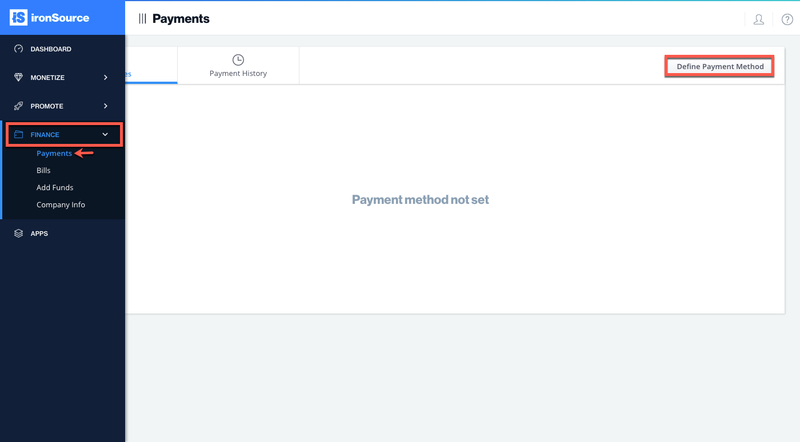 In order to switch your app(s) from Test into live mode, you must provide ironSource with your payment information so we can pay you the revenue earned by your apps . For information on payment cycles, see Payment Terms and Requirements. You will be asked to enter your password. Finally, you will have to enter the relevant information based on your chosen payment method. eCheck/ Local Bank Transfer, you will be requested to fill in your Account Name, Bank Name, Bank City, Province and ZIP code, Swift and IBAN number. Wire Transfer, you will be requested to fill in your preferred payment currency, Account Name, IBAN, SWIFT, Bank Name & Address and Branch Name. PayPal, you will be requested to fill in Email Address, First Name and Last Name. Click ‘Done‘ once finished and your payment information will be saved! Receive payments directly to your PayPal account (exclusively in USD). The payment is subject to a handling fee of up to $1. Receive your payments by Wire Transfer! The payment is subject to transaction fees depending on location. Receive payments to your local bank! The payment is subject to transaction fees as well as currency conversion fees. If you’d like to switch your payment method, simply select another method and click ‘Save‘. You will be asked to enter the account owner’s password (the account owner is the creator of the account and cannot be altered). For assistance, please contact our support team.